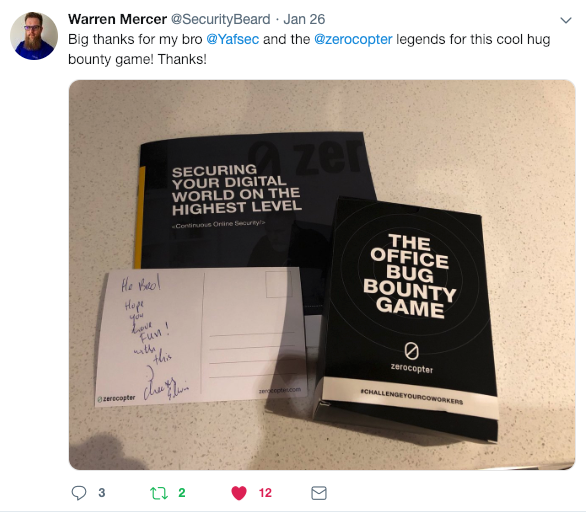 We, at Zerocopter, have a bug bounty platform, with the best of the best vetted hackers. But bug bounties is not a term that always rings a bell with people responsible for security in companies. So we had an idea. What if we developed a game to teach them bug bounties. Where people in offices around the world could get the grasp on how bug bounties work. They will have fun playing it and get a little more security awareness in the process. And we had fun building it. A lot of fun! We thought of common office vulnerabilities and how to explain the risk. We designed the rules and thought of ways to play it. Then we forgot about it. Until november. Because we wanted to send something special to our clients. So we started where we left off, professionalised it, and gave it to a design team to make it awesome. When we first saw the final product, we were stunned. WOW! Did we create that? It looks so nice!! And it is actually fun to play! And it brings awareness as well! The game is easy and mimics our Zerocopter platform in an offline way. You assign someone or a team a “triage’ rol, the game masters or referees. When you see a coworker doing something nasty, you shoot a pic or get the evidence of the wrongdoing in another way. Go to triage, show the evidence and get a bounty (money) card. The wrongdoer gets the card with a funny explanation of their crime. But the bug is never out of play. Players can keep claiming the bounty for the same bug when they come across it. This means the crime can be committed over and over again, like in real life. Fun, games and learning about security while playing. We shipped the games to our clients and relations, and that's when it started. It got attention. A lot. We got many mails, messages and calls, with one message. “I WANT A GAME AS WELL”. As we only printed a small batch, we can't get everyone a game. But we thought about it, and came up with an idea. What if we do a kickstarter like solution? First come, first serve. 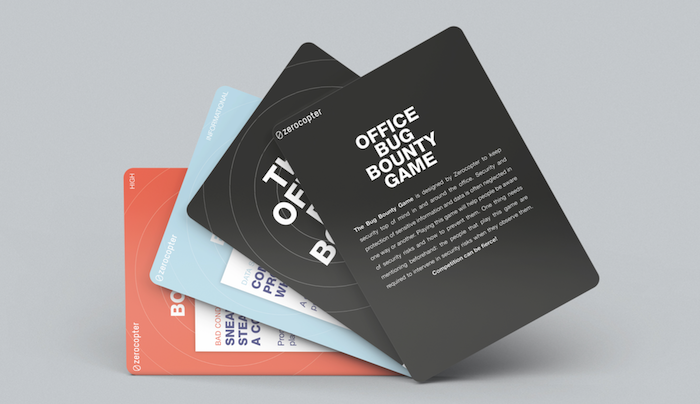 You can buy a Bug Bounty Office Game for €49,95 (excluding tax/shipping) from our current batch while it lasts. We will then, if there are enough requests, make more, make it even better, call it the second edition and ship them at €99,95 (excluding tax/and shipping). Sounds like a plan? 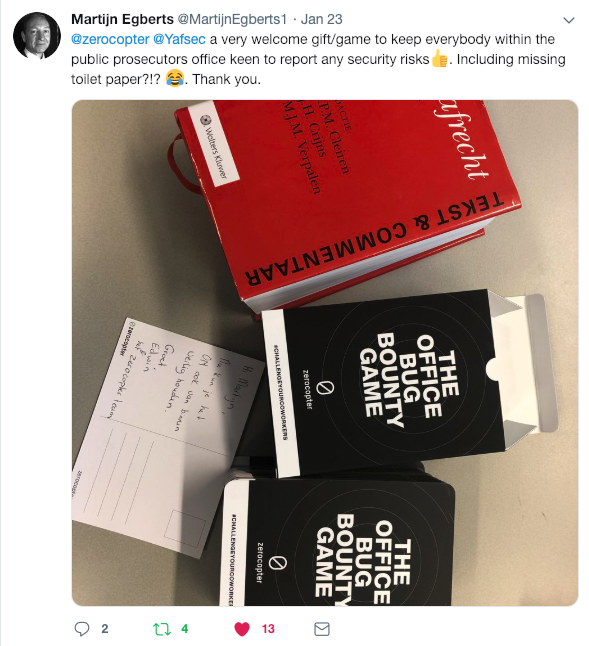 How to order The Office Bug Bounty Game? Send an email to info@zerocopter.com with your billing address, shipping address and any comments. We will then get back to you with the costs and a shipping date. We want to make The Office Bug Bounty Game better! Do you already have one? You will probably have suggestions on cards that you are missing, you found a typo or anything else. Please let us know at info@zerocopter.com.